UPDATE: PeoplesHub has moved from a dream to a reality. You can find our first 10 courses now online. These are engaging, live trainings with experienced activists and leaders from communities around the U.S. Core trainings are for groups that are looking to bring the 4 r’s — resistance, resilience, reimagination, and restoration — to their community, and who want to build up their own group culture. Workshops are for individuals to sharpen their skills and go deep. Join us! And follow us on Facebook and Twitter. ANNOUNCING: A start-up venture to bring skills and mentoring to communities all over the country who are making change where they live. PeoplesHub will build on the kinds of stories featured in “The Revolution Where You Live,” and YES! Magazine. But we’ll take it one step further by teaching the skills and strategies for making powerful change. Have you wondered how to go about making change where you live? Where do you start? And how can you be most effective and inclusive and build the local power to get things done? 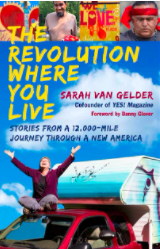 In late 2015, I took a four-month road trip around the United States that resulted in the book, “The Revolution Where You Live.” I visited places on the margins of society, many of them in red states—rust belt cities, Indian reservation, southern communities, and the mountain west. My take away? The changes that are profound enough for these times of crisis are coming from place-based communities. Big government, big business, and even big nonprofits aren’t going to do it for us. The election of Donald Trump made this idea even more urgent. Millions of people have been mobilized, and many are looking for ways to make change where they live. Local power is poised to take off. For this movement to succeed, though, we need to spread the skills of community change—and with online learning platforms, we can now do that quickly and at low cost. An online training program for people who want to learn together the skills of making profound change in their communities and for those who are prepared to teach others about building local power. People who have made change in communities, especially front line communities. People skilled at some of the key strategies needed to make change where you live. Skills for opposition—stopping police brutality, a big box store, or fracking, for example. Skills for building the kind of community we want, with cooperatives, community energy, relationships that are anti-racist and supportive. Skills needed to do both—resolving conflicts, and holding excellent and energizing meetings, for example. We couldn’t find other places where people can learn online, together, in their own communities, from their peers in other communities. We think that the group that learns together is best able to organize together. And we think it’s in our communities where we are most powerful. The trainings will happen live, via webinar, so the process can scale up at low cost. The trainer will interact with trainees on line, so they don’t incur expenses for travel and time. Multiple groups in various locations could learn at the same time, and trade insights and experiences as they gain skills. The process will be interactive and hands on, not a boring lecture, so all learning styles are engaged. Why learn as a group? The trainees will take the class together so they can interact with each other, connecting with the trainer via an internet link (Skype, Google Hangout, Zoom, or another similar platform). Learning together allows participants to practice together, discuss how the trainings apply to their local situation, and build cohesion. The trainings will include group discussions and exercises to build skills, strengthen relationships, and counter isolation. By training teams, rather than individuals, groups can avoid the lone-wolf syndrome in which one person risks burn-out by doing too much of the work. A group that studies together can reinforce the learnings, giving local organizing a jump start. Ideally, there may be multiple groups logging on to any one training, and they can inspire one another with their experiences in various locations. Those who take classes will be asked to make a small donation, but no one will be turned away. The training fees will go directly to the trainer. The infrastructure, website, staff time, set up work, etc, will be funded by donations and grants. Change is most powerful, profound, and democratic when it starts at the community level. People in communities know best what they want to change or create. But they may need specific know-how and skills to do it, and examples of success. People are emboldened and energized when they work in groups. Isolation is the enemy of empowerment. The people who know best how to teach people to do community change are people who have a track record of making change in communities. Community-based trainers deserve to be respected for their knowledge and paid for what they know and share. The school should have an explicit anti-oppression theory and practice that informs all the work. Trainings should offer skills for making change, opportunities to build cohesion in local group, insights into local solutions that work, and resources for personal healing, transformation, and empowerment. Big picture conversations are also energizing and empowering when coupled with action. Trainees can also be or become trainers. A goal is to de-professionalize and decolonize social change leadership, making it something that is accessible to all communities, and culturally relevant. The training will be offered to locally based groups of all sorts that are inclusive of all regardless of race, gender, sexual preference, and that value equity and environmental stewardship. The school is designed to scale. Just as Air BnB allows people to define themselves as hosts or guests, this platform will eventually allow trainers and trainees to post profiles and easily find each other. Vetting of trainers will be needed at the outset, until a robust reputation system can be established. Trainers will be encouraged to build in participation and local exercises and discussion so the trainings don’t devolve into lectures. Report backs could include people in other locations. Trainers will be offered access to trainings and information on best practices. Thought leaders and visionaries who grapple together about big ideas, and engage local groups in the conversation. They might address questions of the sort that Grace Boggs would have asked: What time is it in the clock of the world? Where we are in human history? How we can make change? What does the “next system” look like, and how do we get there? Coaches could offer ongoing help to community groups on specific campaigns or dilemmas. This concept is still in development. We have our website up, and are offering our first class!! Find it here. It’s in our communities that we can bring about transformation deep enough to address emergencies like the demise of a middle class economy, the climate crisis, racial injustice, and exclusion. In communities, we can create a new society. Authentic leadership is rooted in communities where we connect to one another, to the local ecosystem, and to our own power. This local transformation is powerful, and we can accelerate it by connecting experienced community-based trainers with people who want to build their skills. Just like to mention that “Indivisible” groups are taking local communities by storm and provide opportunities for face to face action where we live. Google to find groups near you. I really liked your book and hope your power trainings might create leaders for Invisible groups. YES! I feel fully aligned with us. I have been so tired of trying to enact change at a government/corporate level when it’s clear we need to be working locally within our group communities. I have a space, and I believe can gather enough people to train a group. More info on how to make it happen please!! Hi Elizabeth, More to come! We’re still developing this. Maybe you could help us when we’re ready to do some pilot tests of the concept? This is a terrific initiative. Much needed. I have no doubt this will help many people spur positive change in their communities. Bravo Sarah! This is a beacon of hope. Can I be involved? I want to take the courses and help design more. I’d be particularly interested in involving teachers and students—helping them reconnect with why they wanted to teach and learn in the first place. Please keep me posted! Hi Lauren, Thanks for this! Please sign up for the email list on this site, and we’ll make sure you get the latest. I would suggest maybe making the topics for study a little more concrete, more specific and less general. While the ideas you mention are good ones, I think that information is already available widely, and it would be more valuable to see how existing groups have succeeded in implementing big projects, and how that can be adapted to other communities. How about connecting with groups that have made substantial progress in the areas you prioritize – skills for opposition, and especially skills for building community (co-ops, community owned energy, and other sustainable, inclusive community structures)? People like those who run Cooperation Jackson and the Dane County Timebank (now Mutual Aid Network), for example. There are many other innovative and successful groups Yes! has profiled over the years, and we need to be able to build on those successes across communities. Agreed! We’ll be offering both and finding out what resonates. And we’re connecting to those sorts of groups, for sure, as fast as our capacity allows. Sarah, I am so inspired by this article! I started reading it in hopes I would get some ideas about my own on-line group. My group is based on A Course in Miracles and Nouk Sanchez`s The End of Death. It’s about the deeper teachings of Jesus and how to be in the world, surrendering our ego-thoughts for the Holy Spirit`s. Learning we ARE all one and coming together one-by-one is the only answer to our perceived problems. You have indeed inspired me and I will stay posted on the progress of this divinely inspired project! Thank you, thank you! I like learning and sharing what I know– also meeting folks. I’ve enjoyed becoming more politically active, but I think it is too narrowly focused for me. I dream big. After over a decade of living, practicing and teaching community and neighborhood wellbeing (systems transformation via Asset Based Community [inspired and led] Development), I am delighted and inspired by Sarah’s clarion call to join with an expanding network of rooted and linked (Paul Sparks and Parish Collective use a similar term) practitioner/trainers. The place-based, relationship-rooted, community-empowering work (linked via People’s Hub) is an effective response to the unilateral powers that seek to dominate and etiolate the fabric of our common humanity. I welcome the connection and planning with other inspired and action-oriented practitioners, learners and teachers of rooted and linked wellbeing. In these times, the skill sets being taught in this course are a must have for those who care about our planet and its inhabitants. Hello..I am Michelle White an educator and work with many in the Higher Ed. community would I’m sure would like to be involved. Diversity with our communities coming together is vitally important as we collectively “spread the skills of community change.” I have signed up on this website and another of your websites. I listened to you on the “Tavis Smiley” show this week and am standing ready to do my part. If help is needed for workshop facilitators or “train the trainer” classes, I am available as well as other colleagues that are active in the community. I am very inspired by you and your organization. Thank you. Hi Michelle, Thanks for reaching out. Could you fill out this form, if you haven’t already, so I know how to reach you? Thanks! I am excited about this project and would recommend a resource! http://www.povnetu.org// is, similarly, a free online school for those wanting to gain skills in community advocacy. It comes out of the activism community in British Columbia, Canada. It is connected to a broader online activism community found at http://www.povnet.org/. Hope their example bless you! Thanks, Jessica. Good to know! BTW, some of us are just south of you, in Seattle.